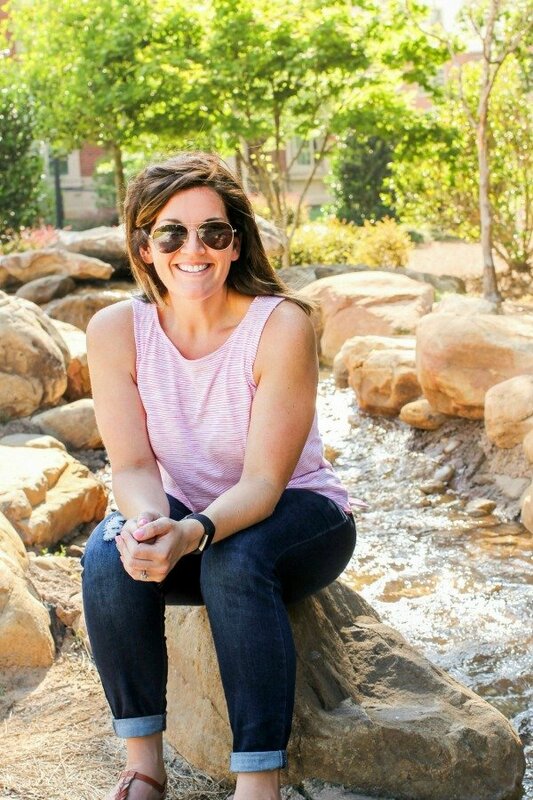 April 9, 2018 By Allyson 16 Comments This post may contain affiliate links. Read my disclosure policy. Making homemade pizza is a cinch with pre-made dough and healthy fresh ingredients! 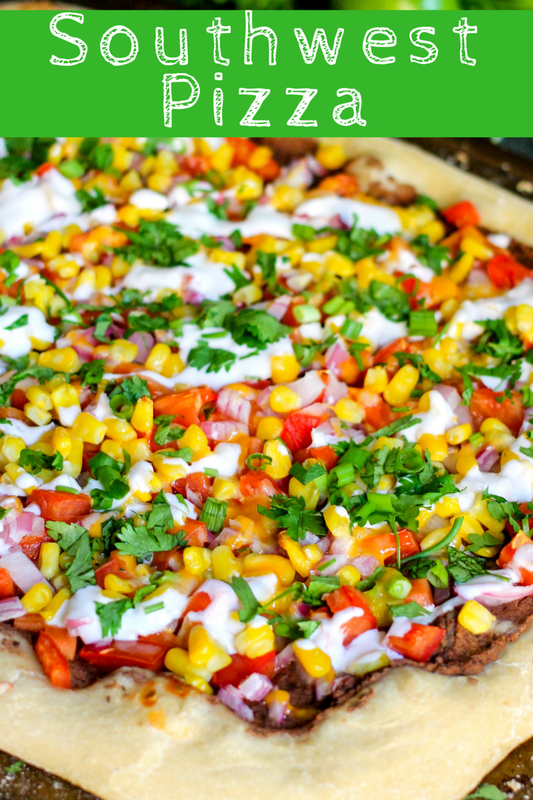 This Southwest Pizza is loaded with beans, corn, tomatoes, red onion, and a lime cream! Making pizza at home is such a comfort for me. 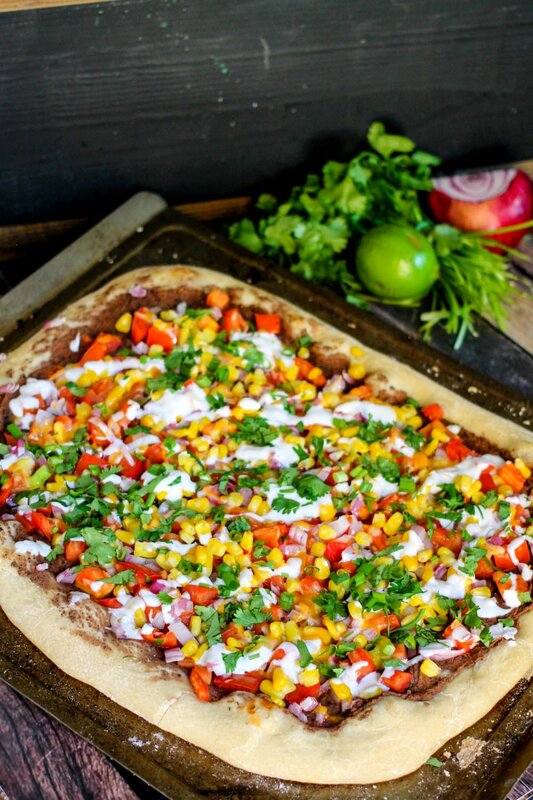 I love making vegetarian pizzas, and this Southwest Pizza is a staple in our house. Sometimes I make the pizza dough homemade, but when I am in a time crunch I will just pickup a pre-made ball of dough from the grocery store. I love how this Southwest Pizza comes together in just minutes, takes only a few minutes to cook, and then is ready for dinner! Add the black beans, green chilies, and spices to a food processor or blender and process until you have a smooth paste. Alternatively, you could heat up the beans and then add the spices and chilies to a bowl, then smash with the back of a fork until you have a thicker paste. Smooth the paste over the rolled out dough, then top with all the fresh ingredients. 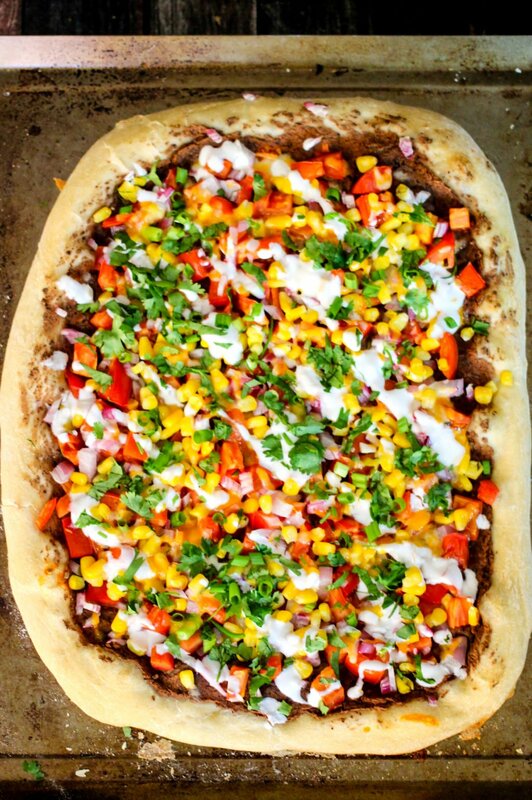 Cook and voila – the Southwest Pizza is ready for dinner! Yes! 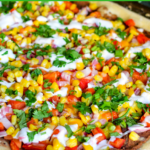 Southwest pizza is a healthier pizza option because it is full of fresh vegetables! It is packed with protein from the black beans, and then topped with nutrient rich vegetables! If you want to make it even more healthy, you can use a whole wheat crust as the base of your pizza! A Southwestern Salad with Jalapeno Ranch is mouthwatering delicious! You probably have most of these ingredients at home! Southwestern Stuffed Zucchini Boats are easy, delicious, and majorly healthy! Only 127 calories per serving!!! Southwestern Stuffed sweet potatoes are full of beans, corn, and spices! A dash of lime and cilantro and you have one kicked up healthy meal! These bad boys only have 230 calories for a WHOLE (2 halves) potato!!! Southwestern Flatbreads are very similar to Southwest pizza, however these are individual versions bakes on delicious Indian Naan bread! You can even make easy homemade naan to go along with these flatbreads! Preheat oven to 450° F. Place a pizza stone or baking sheet on the middle rack to pre-heat with the oven. Using parchment paper, sprinkle cornmeal around the top (this prevents sticking), and place the dough into the center. Press or roll the pizza dough as thin as you like it. Using a food processor, add black beans, green chilies, chili powder, cumin, salt, and olive oil to the bowl, and process until smooth. Spread the black bean mixture over the top of the dough, leaving a 'crust' around the edges. Add diced tomatoes, red onion, and frozen corn. Slide the whole pizza into the oven on the baking sheet or pizza stone. Bake for 10 minutes or until edges of the pizza are just starting to turn golden. Remove the pizza, sprinkle the the cheese and green onions on top, and bake for another 3-5 minutes until the cheese is completely melted. Remove from oven, set aside. In a small bowl, mix sour cream or Greek yogurt with lime juice. Drizzle mixture over the top of the pizza. Add chopped cilantro on top if desired. looks delicious! i love fast and cheap recipes! YUM! I wouldn’t have thought to put beans and all those delicious toppings together on a pizza! omg you would love it Lauren! looks so good and it doesn’t even have meat! This is a great meatless recipe option. With the hearty beans, you don’t even miss the meat! I love everything about this pizza, and it looks amazing! So flavorful! This looks heavenly! It has such a punch of flavor! Wow, my family will love this! This is such an amazing idea! Perfect for our next pizza night! This is so colorful and festive — it reminds me of confetti! Let’s celebrate!